A worldwide network of giant detectors such as Virgo is necessary to detect and localize gravitational waves. Virgo does not operate in the same way as optical telescopes that point at a direction in the sky. It is an antenna that detects waves from any direction. In order to localize a source of gravitational waves a triangulation process is necessary: this means that we need at least three antennas placed at different position on Earth. This procedure is very similar to that used by seismologists to determine where earthquakes originate. Having three detectors in operation also help to disentangle real gravitational signals from spurious ones, that could be triggered from various sources, including motion of the ground or small disturbances of unknown origin. These spurious signals are likely to be local, so it is almost impossible that they are detected at the same time in detectors separated by large distances on the planet surface. This network of antennas has been set up since 2007. Besides Virgo, there are the two 4-km long interferometers of the Laser Interferometer Gravitational Observatory (LIGO) located in the United States near Livingston, Louisiana and Hanford, Washington. There is also a fourth interferometer belonging to this network, GEO600, which operates in Germany near Hannover. The scientists working on these four detectors collaborate and have been sharing their knowledge for the antennas technologies. Furthermore, this scientific collaboration has been extended so that data from the detectors has been shared and analysed in a common framework since 2007. Since 2007, the data from the LIGO, GEO and Virgo detectors are shared and analyzed together as from a single “telescope”. Sharing the data is of main importance to reject local perturbations in the data and to localise the gravitational wave in the sky, i.e. to make astronomy. 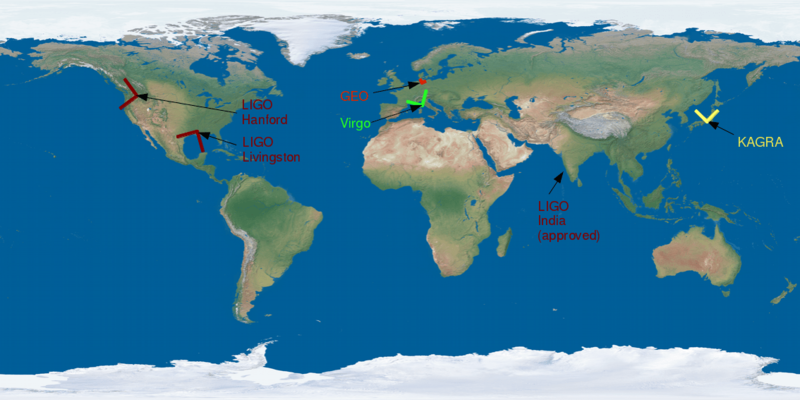 From 2007 to 2011, Virgo, LIGO and GEO600 have formed the first worldwide network of interferometers in history and have observed the sky for gravitational waves. This collaboration will continue in the era of the Advanced Virgo and Advanced LIGO, which will continue to share the data that will be collected in the coming years. In the near future, the network will grow further, with the construction of two new antennas. The Kamioka Gravitational Wave Detector (KAGRA), under construction in the Kamioka mine in Japan, which plans to begin operations in 2018. IndIGO will be a third twin of the LIGO interferometers and will be built in India and start operation in 2019. This extended network, with more sensitive detectors will improve our view of the gravitational wave Universe.